Every year we looked forward to the Ganesha Festival and the sweets and savories which came along with it. 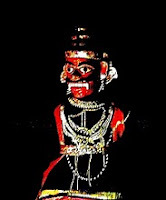 The festival was celebrated with grandeur and the immersion of the idol was carried out with great gusto. 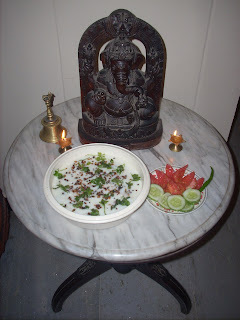 (a salad prepared with soaked pulses) to offer to the Lord. My little brothers carried the idols of Ganesha and Gowri (Ganesha’s mother) in a basket towards the open well in our garden. My sister and myself chanted the prayers and kept ringing the bell as we followed them. The basket was placed on the parapet wall of the well and father offered the food along with other offerings like coconuts, bananas, betel leaves with aracanuts to the deities. He waved a lamp as a mark of devotion to them. Mother took out a scoop of the curd rice and bundled it in a piece of cloth. Then she tied this on to the Lord’s belly to keep him satiated until he reached his heavenly abode. Finally the divine mother and son were lowered into the well along with the basket with the help of a rope and the pulley until they touched the water. One tug at the rope and they were gone till the next year. Mother served the prasadams to the entire gathering. We tucked in the luscious curd rice and the sundal as much as we could, sitting in the garden. As a college student I always carried a steel tiffin box full of curd rice and baby mango pickle to go with it. My friends ‘shared’ the curd rice amongst themselves and I had to be satisfied with a meager bite of roti from one girl or a small piece of idli from another. Our food fussy children can gobble up any food in no time if served with a big bowl of curd. My son and daughter-in-law skipped the last meal served in the international flight just to savour the curd rice waiting for them at home. 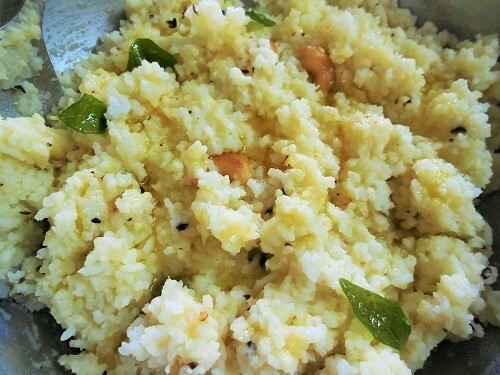 Curd rice is an any time filling dish which can be prepared in a jiffy. In some preparations the rice and curd (butter milk will be an appropriate description) stand apart like estranged couples. In hot climates it becomes sour and unpalatable. Curd rice tastes good when the curd and rice deliciously blend together to form a ‘homogeneous’ dish, as my grand son puts it. The taste can be enhanced with various types of garnishing and seasoning. 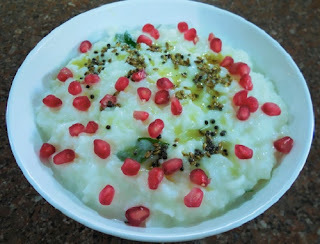 Carrots, cucumbers, mangoes, pomegranates, to name a few, go very well with curd rice. Once the dish is ready let loose your imagination to create delicious combinations. When I served it topped with pieces of strawberries it drew acclamation from my husband who was otherwise a very conservative foodie. You can even top it with boondies ( fried drops of crispies prepared with a paste of Bengal gram flour), roasted cashew nuts, ground nuts, and even chips. The list is endless. Curd rice gives a great satiating feeling at the end of a meal or even if it is THE meal. Bengal gram dal - 2-3 tbsps (Soak until soft). 1. Wash and cook the rice in a pressure cooker with 3 cups of water. 2. Scoop out the cooked rice in a bowl while still warm. 3. Add salt and curry leaves and mash well with clean hand. (Hand is the best tool to get a desired consistency). 4. Add curd to the smoothly mashed rice and mix thoroughly. 5. Add milk and blend well. 6. Add a cup of crushed ice and mix well to avoid hardening.Curd rice is now ready for seasoning. 7. Heat oil in a pan and add the mustard seeds. 8. When it splutters add black gram dal and fry till it turns golden in colour. 9. Add the grated ginger and the green chillies and toss. 10. Drain the water from the soaked Bengal gram dal, add it to the seasoning and keep tossing until a pleasant aroma arises. 11. Pour it into the curd rice and mix. 12. Decorate with fresh green coriander. Omit soaked dal if you want to use cucumber pieces, carrot gratings or mango pieces. The dal can be added dry in the seasoning along with black gram dal. If you want a fruity curd rice mix in pomegranate, green grapes, rose flavoured grapes, raisins, or pine apple pieces and season only with mustard seeds and cumin seeds. This was invented by a friend who loved to eat curd rice even in the extreme cold winters of Delhi. 1. Prepare curd rice in the usual method and keep it side. 2. Heat 2 tbsps of cooking oil in a big pan. 4. Add black gram dal and cashew nuts and roast till golden in colour. 5. Add 2 or 3 pieces of cut green chillies, grated ginger, and finely minced onions and sauté till the onion turns pink or golden in colour. 6. Add minced tomatoes (optional) and remove from stove. 7. Immediately stir in the prepared curd rice and blend well until the rice absorbs the heat of the pan. 8. Serve hot with a roasted masala papad. This is most preferable on cold rainy days. Whenever I tried to woo my children into eating Ven Pongal I have received only negative responses. Once my youngest son was virtually in tears when he learnt that the much hated Ven Pongal awaited him for the after school tea. That was when I banished the dish once and for all from my kitchen. All my efforts to prepare a likable pongal were in vain. 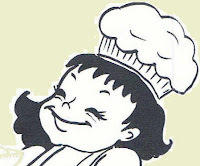 The children even christened the dish with a new name –“ pepper rock”! I remember how my siblings and I thronged the Hanuman temple on all Saturdays, more out of the craving for the prasadam than out of devotion. The hot and spicy Ven Pongal imparted a special aroma when it was served in the dry banana leaf cups. The prasadams (food distributed after offering it to the deity) at the temple of Lord Venkateswara at Tirupathi are relished with devotional fervor by one and all. The specially prepared Ven Pongal with a liberal amount of cashew nuts thrown in and dribbling with ghee is a covetable prasadam. We had attended a feast at my mother’s place. After the Pooja, mother served the prasadam to one and all during the lunch. I was surprised to see my children lick away the prasadam – Ven Pongal- off the banana leaves, leaving the leaves clean and shiny ! Mother must have prepared the dish with great care and affection for it did taste awesome. Ven Pongal is a very healthy and nourishing dish suitable for breakfast. With a chutney, raitha and a roasted papad it can make a sumptuous noon meal. Usually a spicy tamarind gravy is served with it. INGREDIENTSRice -1/2 tea cup or 125 gms. Split green gram dal – ½ tea cup 0r 125 gms. Cooking oil - 2 to 3 tsps. 1. Wash rice and dal together . 2. Add water and milk to the washed dal and rice and set in a cooker. 3. Add the split green chilly, salt and cooking oil. 4. Pressure cook until four whistles and allow it to cool. 6. Add asafoetida, coarsely crushed black pepper and cumin seeds. 7. Add cashew nuts and roast until I turns golden in colour. 8. Add grated ginger, curry leaves and finally add the coconut gratings. 9. Remove from the stove and add this seasoning to the cooked Ven Pongal and stir well. 10. 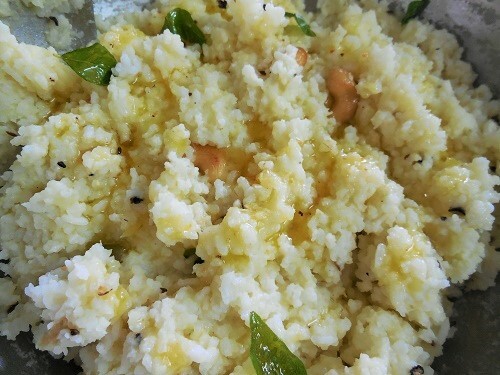 Ven Pongal is relished in a porridge like consistency. Cooked with less water or little oil makes it very hard. 11. Add a dollop of fresh ghee and let it melt on the hot pongal before serving. 12. Serve with chutney, raitha or gojju.